Up to 70 elements of the periodic table can be detected and quantified from ppb to percent levels with the Perkin Elmer Optima 3300DV. This instrument is capable of the simultaneous determination of metals and other elements (for example B, P, S) in such matrices as waters and wastewaters, soil digests, soil extracts, plant and animal digests, fuels, pharmaceuticals, catalysts, hydrofracking fluids and organics. The sample introduction system can handle dissolved solids up to 3%. 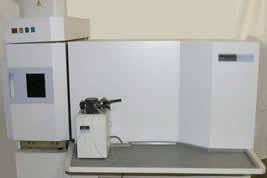 The unit is equipped with an AS-93 autosampler for large numbers of samples. In ICP-OES a sample in solution is introduced into an 8000K argon plasma. The plasma evaporates the solvent, vaporizes the sample, atomizes the sample, and thermally excites the valence electrons of elements present in the sample. The excited electrons emit electro-magnetic radiation at characteristic wavelengths. The intensities of these wavelengths are read out and converted to an elemental concentration by comparison with concentration standards. Analytical and Technical Services customers include academic researchers from within ESF as well as other regional institutions, government agencies, and private enterprises.